Can the President convince Congress to attack Syria? On the left: Stephanie Cutter. On the right: Newt Gingrich. 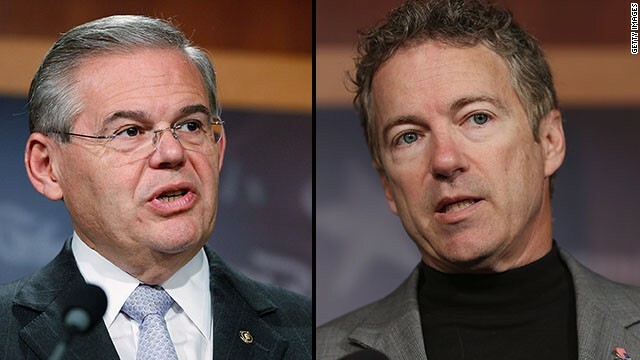 In the Crossfire, Senator Rand Paul, who opposes a military strike on Syria and Senate Foreign Relations Chairman Robert Menendez, who supports a limited strike. I agree. Between Menendez's attempt at filibustering the show and Cutter's constant interruptions it was hard to listen to the other two, but I did love CNN putting on a non-liberal point of view. It was great to hear (although limited) both sides of an issue. Great improvement CNN. Your beginning to cover actual news stories and allow something different than strictly liberal guests and commentators. There is hope you may return to becoming a relevant news source once again. Congratulations! Cutter is rude and obnoxious! CNN needs to hire Bob Beckel or even God-forbid Hillary Clinton as the left's voice! Cutter wouldn't let Paul talk! She kept interrupting. Gingrich was biting his lip about the whole thing but I will give him credit for keeping his cool. I don't know if he can do that every show though. First time I have seen the show and as long as Stepanie is on the panel it will be my last. She is an overbearing big mouth with no regard for her guests. Wants the spotlight on herself and over talks her guest. The show might be on for awhile but it wont be because of her. P S Glad I didn't watch the communist Van Jones. Go Fox News. I gave up my religious 6:30 PM NBC Nightly News viewing for your initial airing. Sorry I did so. I am SICK of commentators and guests talking, interrupting and yelling over one another. Gingrich is a much better guest than he is as a host. Your hosts seemed very unprepared for the newsmaking/breaking story. I am an avid CNN fan. The show paled after Mr. Blitzer's intrada. The show's hype was strong. The show was lame. Your producers need to regroup. Can someone tell this ignorant politicians that is NUCLEAR...... NOT NUCULAR, please, it hurts my educated ears. You perhaps, should have proof read your comment before posting it. While you did make a point, I don't think it is the one you had intended. It would seem to more accurately reflect on the shortfalls of our current public education system than the commentator's lack of knowledge on the correct pronunciation of a word. Stephanie Cutter must stop interrupting Rand Paul's responses. I could care less what she thinks, I am interested in what the decision makers think. Shut up, Stephanie! You aren't all that. Bull. Putin is not afraid of BHO. He wants the weapons/power for himself.